cutting away - pages for the christmas art journals, packaging material, images for badge buttons, etc. the computer desk is a mess. with sample buttons galore! 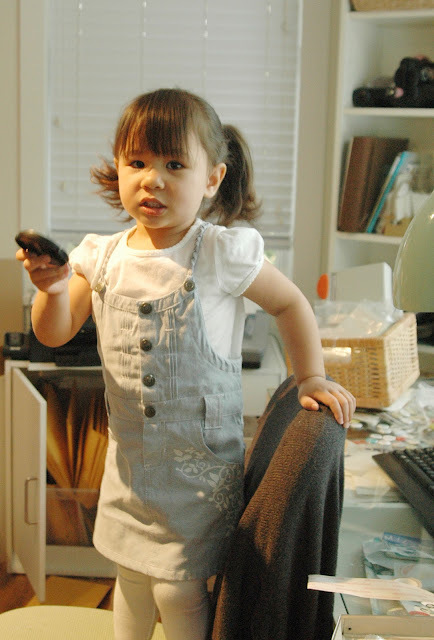 munchkin constantly climbing onto the swivel chair whether i'm on it or not and repeatedly saying, "i wanna help mama." help me alright - help me make a mess! LOL. a little sneak at some badge button sets (on left is V1 of 3 badge button sets that's part of the fall PL collection, beside it is a "love my cat" badges - yes, i made a dog one too!, beside that is the school's cool badge button set). On the far right is the school's in page tab set. some stamped tags to be sewn onto a page of the christmas art journal. Ooo, looks like a lot of fun stuff going on there! What a happy, lovely mess. I can't wait to play with your new products.